The hometown of genius Albert Einstein - Ulm fascinates visitors with its beautiful romantic atmosphere. Along with fine sharp-roofed buildings and impressive cathedrals, the city creates comfort for its guests thanks to its many squares, pedestrian zones and bicycle lanes. Ulm is located in Baden-Württemberg, Germany. The town is nestled on the shore of the Danube and its tributary Iler. The city is among the oldest in Germany. 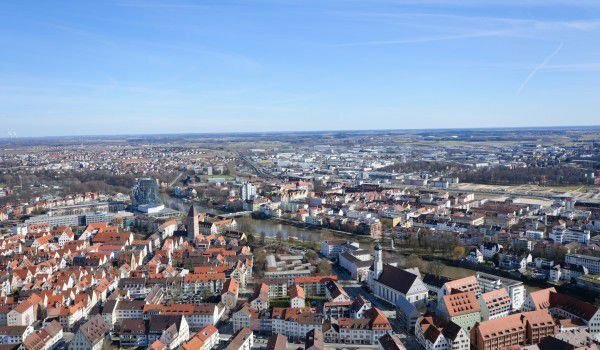 Historical data indicate that Ulm was founded around the 9th century, although there is evidence of life in these lands more than 5 000 years before Christ. There are several places here, that must be visited. 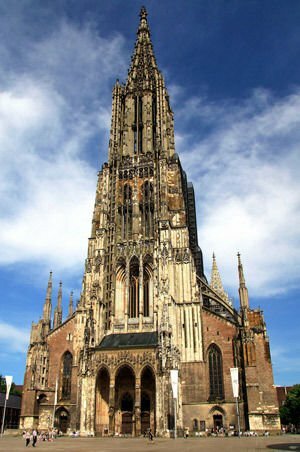 Firstly, we can put the church with the highest bell tower in the world - Ulm Minster. The Lutheran Church was built in the 19th century. It is the highest on the planet. If you have the patience to climb the 768 steps of the church tower, you'll reveal the memorable views of the city and even the Alps. To enter the church you need to pay entrance from 2.50 to € 4. The old part of town is separated from the so-called Fischerviertel, located near the River Blau. There you can see a few preserved and renovated old buildings, some of which are now converted into hotels or commercial buildings. The most popular among them are "curved house" (Schiefes Haus) and the Alte Münz. And this is typical of a western town. It is made using "Wall" construction, where buildings are erected close to each other, creating a long continuous wall around the streets. Every house still retains a specific color and design to fit in. Tradition in many towns dictates that the building of City Hall must be one of the tallest buildings of the city. Ulm is no exception. 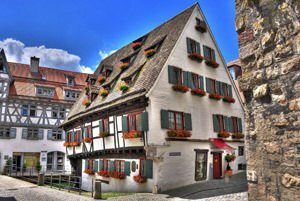 So Rathaus, which houses city hall, was built in the 14th century. On top of it is astronomical clock with nearly five centuries of history. Today Ulm is a well-developed economic and educational center. Perhaps the greatest pride of the city is the University of Ulm, founded in the 70s of last century. This educational institution is relatively small in scale compared with some other German schools. However, the university does take good care of its staff. It has trained over 8, 000 students. An interesting fact is that the initial intentions were for an educational institution named after the great Albert Einstein. This idea, however, failed to materialize. Therefore, the street on which the university is raised, bears his name. Albert Einstein was born in 1879, in a small house on a street called Bahnhofstraße. Today, his house has left no trace. It was demolished in 1944, after air attacks during World War II. Today this place is occupied by a small monument to the genius scientist. Among the landmarks of the city is the ultramodern glass pyramid building of the Library. In the southern part of town is another tourist attraction - Wiblingen Abbey. Much of the eighteen districts of the city are located on the left bank of the Danube. It turns out that the right bank of the river is the occupied by the city's twin - Neu-Ulm. The town has a population of around 50, 000 people. Ulm is just a hundred kilometers from the picturesque hills of the Alps, which in clear weather can be seen in the distance. 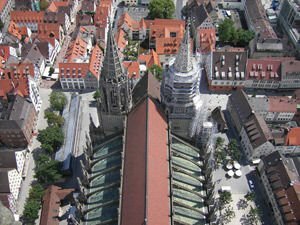 Besides beautiful and romantic, Ulm is among the "most responsible" European cities, in the opinion of the European Union. In 2007 it received the prestigious award for effective and prudent management of energy sources.